Made for my Lovely Daughter. Mid ear to Crown = 7 in. Red Heart Comfort Worsted Weight 4 Ply Yarn. Using white yarn. Slip Knot, ch 2, 10 hdc in slip knot. Hdc to join(mnr). Hdc in ea st around. Hdc to join(mnr). Hdc in same st. *Hdc in next 2 sts, 2 hdc in next st*. Repeat from * to * around. Hdc to join(mnr). Hdc in same st. *Hdc in next 3 sts, 2 hdc in next st*. Repeat from * to * around. Hdc to join(mnr). Hdc in ea st around. Sc to join, Ss in next st. Do Not Fasten Off. Turn, hdc in next 7 sts. Turn, hdc in next 6 sts. Turn, hdc in next 5 sts. Turn, sk first st, hdc in next 3 sts. Turn, hdc in next 3 sts. Fasten Off. Pull slip knot through st you previously marked. Working from left to right, Repeat Rows 1- 8 of previous ear flap. 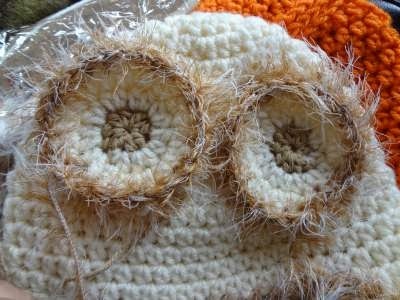 Ss to join new yarn(fur) to bottom of hat(base trim), Ch 1, Sc evenly around, placing 2 sc in corners and end of earflaps. Ss to join. Fasten Off. With Scrap beige/brown yarn, slip knot, Ch 2, 8 hdc in slipknot, yo, insert hook, pull through new yarn(white), yo, pull through 3 loops on hook to join(mnr). Hdc in same st, 2 hdc in ea st around. Hdc to join(mnr). Hdc in same st. *Hdc in next st, 2 hdc in next st*. Repeat from * to * around. Sc to join, Insert hook into next st, draw up new yarn(fur), pull loop through loop on hook. Ch 1, sc in ea st around. Fasten Off Leaving a long tail to sew eye to hat. 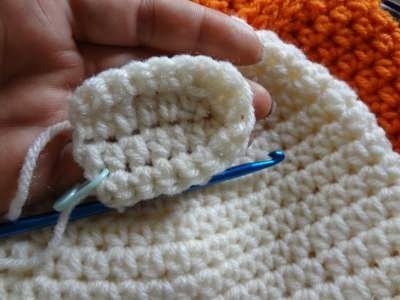 Using the white yarn, Slip Knot. Ch 7, hdc in 3rd ch from hook, hdc in next 4 sts, 3 hdc in slip knot, Don't turn, Hdc in next 6 ch's on other side of foundation ch. Ch 1, turn, sc in next 6 sts, 2 sc in next st, 2 sc in next st, sc in next 6 sts. Fasten Off, Leaving Tail to sew ear onto hat. Using White Yarn, Slip Knot, Ch 2 , (6 hdc, 6 dc) all in slipknot, Ss to join. Fasten Off, Leaving tail to sew nose to hat. Fur to brow line. 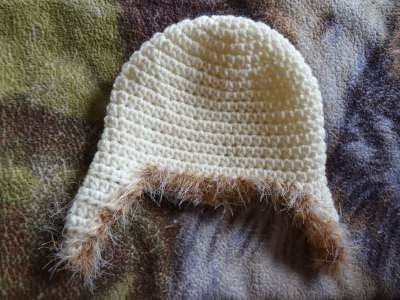 Using Fur Yarn Start at right side earflap middle bottom, Ss eavenly up to 3-4 rows from top /cap of beanie, Ss along bottom of this round along front to left ear mid section, then ss eavenly down to bottom or ear centered. Lay Hat down, Face up. Position eyes, ears and nose onto hat as desired. Pin in place. 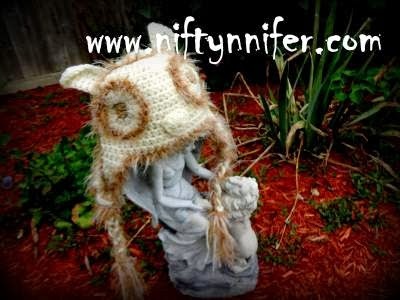 Carefully surface sew each piece onto hat with tails you had previously left on. Cut 12 pieces white yarn at 30 '' long. Cut 6 pieces beige/brown at 30 '' long. Cut 8 pieces fur at 30 '' long. Divide into 2 equal groups, leaving out 2 pieces of fur. Take one group, fold in half. Insert hook from back to front of bottom of ear, draw fold through as one loop, yo, pull all yarn ends through loop. 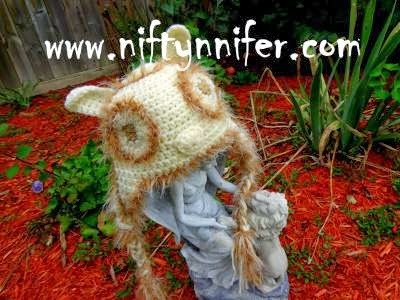 Leave as is or braid it and fasten with yarn fur you set aside.